When we travel to the Disney parks, we like to travel with as little as possible, especially since whatever you are carrying, you will holding for 8-10 hours and across 5-8 miles. That being said, there are certain things that we always like to have with us, just in case! The bag itself is very important! 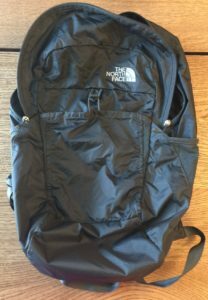 We use this lightweight The North Face bag, and I would recommend something similar to this for a few reasons (Unfortunately, they do not sell this exact bag anymore, however you can still purchase it from Amazon here). As I stated, the bag itself is extremely lightweight, and cutting down on additional weight can help your back and shoulders in the long run! In addition, it has wide, padded straps to make it more comfortable to wear for long periods of time. This bag also has outside pockets for water bottles which makes it easy to grab your water when you need it. 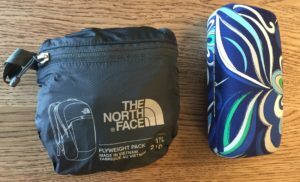 Finally, it folds down to be quite small in our luggage, making it the ideal park bag. We are only 2 adults, we do not have to take any medication and don’t have any dietary needs or restrictions. 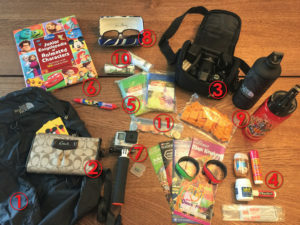 These are things that you might have to take into consideration when packing your park bag. Let me know in the comments if there are other things you cannot live without when you’re spending your days at Disney Parks!